Vietnam’s leading retailer Saigon Co.op announced on Tuesday that it will stop selling plastic drinking straws across its trading system from next month, as an initiative to reduce plastic waste. Plastic straws will be pulled off shelves to make space for eco-friendly alternatives such as paper and edible straws starting May 1, according to Saigon Co.op’s permanent deputy general director Nguyen Anh Duc. The retail giant’s system consists of Co.opmart supermarkets, Co.op Xtra hypermarkets, Co.op Food stores, and two convenience store chains, Co.op Smiles and Cheers. In addition, Saigon Co.op will completely remove plastic straws attached to products sold at its outlets, while requiring merchants leasing space at its hypermarkets to minimize the use of plastic straws. Duc added that in the near future, stainless steel or glass straws, which can be reused multiple times, will be available for purchase at Saigon Co.op outlets as a replacement for the plastic products. Non-plastic straws may not result in great change in consumer habits, but they will tremendously contribute to environmental protection, according to Duc. 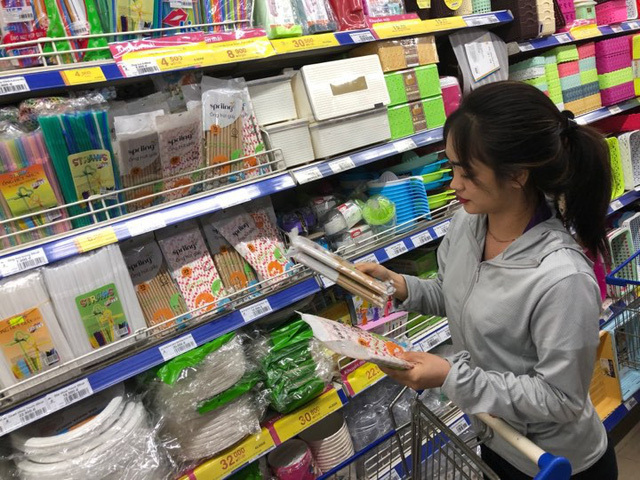 Saigon Co.op is the first retailer in Vietnam to make such a move in encouraging usage of environment-friendly products instead of plastic alternatives. Different initiatives to reduce single-use plastics have recently been taken in Vietnam, at a time when environmental protection is a topical issue in the country. Earlier this month several supermarket chains, including Saigon Co.op, began a step-by-step effort to ditch their biodegradable wrap for banana leaves in their respective systems. In 2011, Saigon Co.op also pioneered in replacing plastic packaging that takes a long time to decompose with environment-friendly biodegradable plastic bags.